Our home’s walls have become more important recently, not only as a security measure but also to look attractive and make a property look its best. To ensure the continued protection of these walls, rendering is often required and it’s great at preventing weather damage to the brickwork. Without rendering, walls may only last between five and ten years before they begin to weaken. With wall rendering, not only do you ensure a structure’s strength, but the walls will be more attractive too and easier to paint. Of course, you’ll have further protection against natural elements too. And in today’s world you don’t have to wait until the summer to have wall rendering performed. New innovations mean that the drying process is now much quicker. Ensuring a waterproof property is crucial, as any moisture getting through the walls or affecting the foundations would prove costly. Thanks to modern advancements, wall rendering is now quicker and easier than ever before. The render now dries quicker and will even last longer, providing added protection year-in year-out. There are a whole range of colours and styles for you to choose from, allowing you to set your home apart from the crowd. Now it’s possible to render all walls, from the home to the garage. Rendering your walls has never been cheaper and professional attention won’t break the bank. With improved life expectancy, the cheaper prices make rendering even more cost effective. Rendering helps to revitalise old walls, ensuring a lasting protection from the weather and an attractive finish that’ll last for years with no maintenance or hassle. For up to four FREE quotes from professional renderers, simply complete our quick form below and hear from vetted and reputable companies in your area. Project: Perimeter wall to property needs repairing. Project: To take off any existing pebble dashing that need's to come off the front of the house, then render or part pebble dash. Project: So, what type of property do you have? Terrace Great, what do you need done? Wall Rendering i have walls to render on a new extension. Approximately 47 square metres to render. 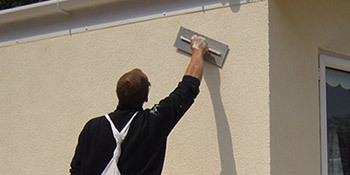 Project: Repairs needed to our rendering there are patches that need fixing and painted. Decided not to go this route, to expensive. No problem at present waiting for sale to go through then will decide.